Thus began an eight-year endeavor spanning thousands of miles, through Texas’ small towns and down its dustiest, loneliest roads. Dorsey photographed hundreds of buildings ravaged by time or adapted for new uses and diligently researched their pasts, posting his findings on his blog. Now, some of those photos and accompanying stories are collected in his new book Lost, Texas: Photographs of Forgotten Buildings, published last May. We spoke with Dorsey to learn more about the genesis of the project, the insights he gained along the way, and the historic preservation movement in Texas. Your book was a long time in the making. Did you have a sense of the scope of the project you were undertaking when you began it, or did it evolve into something larger over time? It was very much an evolutionary process. It really started as just a photographic project. Then somebody suggested that it might make a good book, and that intrigued me, but also scared me. It’s a pretty daunting idea, to think of doing a book of any kind. I decided to start a blog and begin researching the buildings and writing a little about them, learning more about the history of not only the buildings, but the towns they were in. That was in 2011, and I finally got in front of the Texas A&M Press roughly two years ago. It had a long gestation period. I wasn’t on the road all the time. I would research, find buildings, go out and photograph them, post a blog, and do it again—until I went to work on a project out in West Texas. I was by myself, so I’d hop in the car on Friday after work, and head out into the wilds of West Texas and the Texas Panhandle. When I’d get to places, I’d find things serendipitously too, just driving down an old country road and following my nose, so to speak. How did you go about uncovering and unraveling the stories of these buildings? There’s been a publication since the 1950s called the Handbook of Texas, and as a kid growing up, we always had it in the house. Now it’s on the internet and it was one of the first places I would go because there’s almost nothing about the state of Texas that you cannot find on that website. The International and Great Northern Railroad built this hospital and nurses' quarters in the mid-to-late-1920s, replacing their original wood-framed hospital complex from 1884. What’s the one place or story that stood out to you most? Palestine is a small town in East Texas, now [with a] population of around 20,000. The Great Northern Railroad came through the area in the 1880s and established Palestine as a regional hub of operations. They built yards in addition to passenger and freight depots, and consequently employed a lot of people. In the 1890s, they built their first hospital there, a frame building. 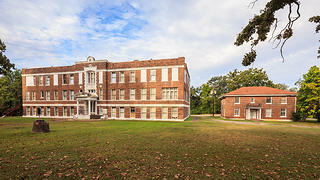 Then around 1920, they built a new brick building (pictured above)—three stories with true patient rooms and operating rooms—and next door built a residence for the nurses. Only around 40 of the 464 Rosenwald Schools built in Texas are extant, including this one in West Columbia. Julius Rosenwald also helped fund the construction of the Lockhart Vocational School, which served Lockhart's African American community for 31 years. 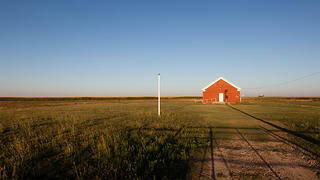 Local families pooled their resources together in 1914 and built Wayside School in Roberts County. Up to 20 children of all ages studied there at a time, and it remained open until 1933. 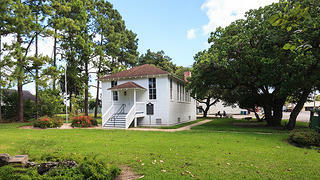 What were your impressions of the Rosenwald Schools you saw? I became aware of the Rosenwald school program before I came across one in my travels. I thought it was fascinating, the whole concept of why Julius Rosenwald wanted to help build schools throughout the South. I was able to find three to include in the book. 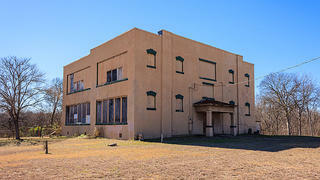 There were two others I found that were in such disrepair that it was almost impossible to tell what they had been. But that whole program was such an incredible resource for helping African American families and communities provide their kids with an education. It was very heartening to read about his philanthropy, the processes they went through to select recipients of the funds, and these beautiful prototype buildings. Rosenwald had around 12 different prototypes, all the way from a one-room to an eight-classroom with or without an auditorium, gymnasium, and housing for faculty. When a community would be awarded a grant, the Rosenwald Foundation would provide the materials, and the town would have to provide the site and the labor. It was an expedient way for non-professional builders to build a school for their kids, with a predictable look and all the pieces arriving, more or less in kit form. Every building you see in the book, every abandoned building you see along a road, was an embodiment at some time of somebody’s hopes and dreams, and their desire for a better life. When reading your book, it’s hard not to feel the weight of the loss of all of these buildings and the history they represent. 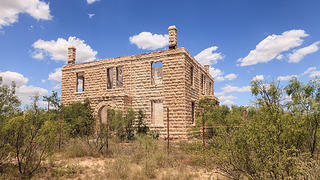 How reflective is this of the state of historic preservation in Texas? Are there any things that need to change? Historic preservation in Texas is as robust as you would find in most parts of the country, thanks in no small part to the National Trust. 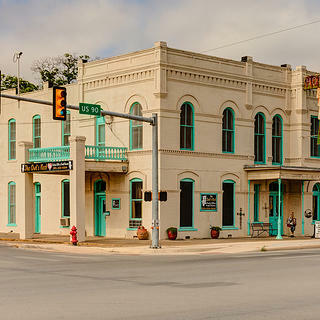 I would say it largely takes place in the bigger cities—Dallas-Fort Worth, Houston, Austin, San Antonio—and as you get into the smaller towns, you’ll see some [preservation] that has been done but it occurs less often. The Koch Hotel in D'Hanis, built in 1906, was restored and reopened as a bed and breakfast in 1998. 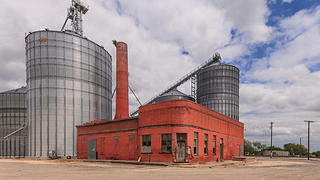 The Granger Cottonseed Oil Mill, part of a complex that included an electricity-generation plant, an ice plant, and a waterworks. The expansion of the railroads in West Texas in 1910 resulted in the town of Stiles being bypassed by most traffic. The former Reagan County Courthouse is one of two sites in town that have received historical markers. How did process of writing and researching book change your view of Texas? A couple things really struck me. One was how this state—and it’s no different than most other states— was almost entirely settled by immigrants, whether they were from a foreign country or the East Coast of the U.S. or St. Louis. The second thing was that in spite of the fact that there were abundant resources when they came here—the forests of East Texas, stone in Central Texas, lots of building materials available with easy access—these were tough people who really had to work hard just to subsist, and the fact that they did and raised families and built farms and towns is a real testament to [their character]. What do you want your readers to take away from your book? I hope they will take time to think about the people who settled their state, wherever they live. About the importance of the small towns as the economies of a state grew, the toughness of the people who left more populous places to come [there], and the fact that every building you see in the book, every abandoned building you see along a road, was an embodiment at some time of somebody’s hopes and dreams, and their desire for a better life. And the remnants of these old towns, I hope, remind people of where they came from or their families came from, and that those places are worthy of being stabilized and preserved.